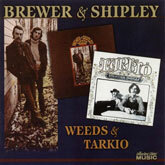 After introducing their harmony-driven brand of folk-rock on their late-'60s A&M debut album Down in L.A., singer-songwriter-guitarists Brewer & Shipley moved to the Kama Sutra label to expand their sound in new directions for Weeds and Tarkio. How Michael Brewer and Tom Shipley ended up on Kama Sutra after just one A&M album takes some explaining. "We really didn't care for L.A. very much," says Brewer. "We had just had enough, and figured there had to be a better way to make music, without living there. So we left California, and ended up coming back to the heartland. We ended up in Kansas City and started a management/production company with some friends, Good Karma Productions. "At the time, it was just unheard of to not live in L.A., Nashville, or New York if you're actually in the business. So the people at A&M pretty much thought that we'd just quit the business and gone home. But, of course, we hadn't. We were just going back to what we'd originally done, which was traveling around and perform[ing] our songs for people. We got out of our contracts with no problem, 'cause they just assumed we'd quit the business. "Our management went to the east coast to shop some labels. Buddah [of which Kama Sutra was a sister label] signed us, because [Buddah executive] Neil Bogart at the time was known as the king of bubblegum -- you know, [Buddah Records act] 1910 Fruitgum Company and all that stuff. He was trying to shatter that image, and looking for album artists. And that's what Tom and I were. We were never about singles. Every song on our albums was just as important as the next one. All of our albums, we meant to be whole packages." Both Weeds and Tarkio would be recorded in the San Francisco Bay Area with producer Nick Gravenites. Brewer & Shipley's management hooked the duo up with Gravenites, who'd already made a name for himself as a member of the Electric Flag, as well as writing songs recorded by the likes of the Paul Butterfield Blues Band. Gravenites was instrumental in assembling the backup musicians for Weeds, who included guitarist Mike Bloomfield (who'd played with Gravenites in the Electric Flag); keyboardist Mark Naftalin, who'd played alongside Bloomfield in the Paul Butterfield Blues Band; violinist Richard Greene, who in the '60s played with bluegrass giant Bill Monroe, the Jim Kweskin Jug Band, the Blues Project, and Sea Train; and Nicky Hopkins, the most esteemed session keyboardist in '60s British rock, who'd played on important records by the likes of the Beatles, Rolling Stones, Kinks, and Who. The countrified feel to much of the record was supplied in part by ace pedal steel guitarist Red Rhodes, who played on such classics as the Byrds' The Notorious Byrd Brothers and James Taylor's Sweet Baby James. "Down in L.A. was pretty much made up of L.A. studio guys, plus a friend or two here and there," observes Michael Brewer when asked how the duo's recorded sound changed between their first and second records. "Weeds took on a life of its own; it kind of created sort of a hybrid music between our style and [the session musicians'] style." Brewer was also pleased with the album's country-rock accents: "Weeds, along with the Byrds' Sweetheart of the Rodeo, were two of the first albums of the time to incorporate more of a country thing. We liked the sound of the pedal steel guitar played other than just a real twangy, hokey old-fashioned country...the instrument itself, we thought, could be incorporated into more of a folk-rock genre." All of the material on the record was original save Bob Dylan's "All Along the Watchtower" and the more surprising "Witchi-Tai-To," which had been a small hit for Everything Is Everything. Brewer & Shipley learned it off an FM station beaming out of Little Rock, Arkansas, as "while we were traveling all over the heartland late at night, that would be one of the only things we could get on the radio. 'Witchi-Tai-To' was getting a lot of FM airplay, and we just loved it, 'cause Tom and I have always been into Native American culture and music. I'm from Oklahoma, so I grew up with it all around me. We learned it off the radio, and sang phonetically. I think we got the Indian part right, but I don't think we're singing the English right to this day." Their next album, Tarkio, boasted a similar sound, again with the help of session players and Gravenites. The most celebrated guest appearance was by Jerry Garcia, who contributed pedal steel guitar. "Wally Heider's studio in San Francisco had a bunch of the Bay Area [musicians] in there every day," says Brewer. "It was like going into the office. The Dead was in there every day, or some offshoot of the Dead; the Airplane or offshoots were in there every day, Hot Tuna or whoever. We knew a lot of them from back in the folk days. I met Paul Kantner when he played banjo and had a flat-top haircut, so we went back a ways with some of these people. Jerry had just started playing pedal steel guitar. He came in one day, and we were working on some stuff. We said, 'Hey Jerry, we got a song here, would you like to play pedal steel?' And he said, 'Sure." So he set up his pedal steel and played on a song called 'Oh Mommy, I Ain't No Commie' -- the B-side to 'One Toke Over the Line.'" As can be gleaned from those song titles alone, there was an increasing reflection of the turbulent times in the lyrics. Tracks like "Fifty States of Freedom," "Don't Want to Die in Georgia," "Tarkio Road," and "Song from Platte River" mused on both freedom and the restrictions placed upon it for many young people circa 1970 who were redefining personal expression in the United States. "Our music has always been somewhat autobiographical, reflecting our own experiences at the time," explains Brewer. "Our first three albums are like mini-time capsules in retrospect. Vietnam was still raging, and a lot of social unrest. We were experiencing that along with a lot of other people. I think that's why a lot of people could relate as well as they could to the music. "Tom and I were traveling all over the heartland, and especially in the South, we pretty much were living Easy Rider. 'Cause here we were, a couple of guys wearing Nehru shirts, beads, and you didn't see a whole lot of that in those days. We really did have to pick and choose where we stopped to get something to eat or check into a motel or get gas." One such experience inspired "Don't Want to Die in Georgia": "One time we were doing something in Atlanta. John Lloyd, a black man who was a regional representative for Kama Sutra, was showing us around. There was so much tension, just because of the way we looked. And here we are with a black man too, and everybody knows how they were regarded, in those days especially. 'Don't Want to Die in Georgia' was sort of a metaphor for 'don't want to die anywhere,' really. It just happened to be Georgia. "A lot of people would say a lot of that stuff was very political. But to us, it wasn't political at all. It was just social commentary, rather than political commentary. And even though we had social commentary, we also had spiritual commentary. That's probably why we're glad the message came across without slapping anybody in the face, or trying to cram anything down anybody's throat. We were just reflecting our own views. We've always pushed love as the only answer we know of that might fix things. I don't know how that's ever gonna happen, but that's what we think." It was a far more lighthearted song, however, that would both give Brewer & Shipley a Top Ten single in early 1971 and spur condemnation from the highest levels of American government. "One Toke Over the Line" was, discloses Brewer, not envisioned as a single by the duo "at all. We wrote that one night in the dressing room of a coffee house. We were literally just entertaining ourselves. The next day we got together to do some picking and said, 'What was that we were messing with last night?' We remembered it, and in about an hour, we'd written 'One Toke Over the Line.' Just making ourselves laugh, really. We had no idea that it would ever even be considered as a single, because it was just another song to us. Actually Tom and I always thought that our ballads were our forte. "But the first time we played Carnegie Hall, we were opening for Melanie. We went over really well, got a couple encores. But we kind of ran out of songs, and for our second encore, we said, 'Let's do that new tune we just wrote.' So we did it, and Neil Bogart came backstage and says, 'I love this. You gotta record it, you gotta put that on the album,' because we were in the process of recording Tarkio. So we said okay, recorded it, added it to the list, and didn't have a clue that it would ever be released as a single, much less end up being the controversial thing that it was. In fact, vice president Spiro Agnew named us personally on national TV one night as subversives to American youth, which we thought was hysterical. We made Nixon's enemies list, which was a badge of honor we hold dear to our hearts to this day. "So go figure. Who would have guessed? Much less that it would end up being a classic rock song still played all around the world, in movies and stuff. It cracks me up. 'Cause we were just kidding, we were just entertaining ourselves. Other people chose to make a big deal out of it." Brewer & Shipley would go on to record five more albums in the 1970s before splitting at the end of the decade, although they reunited in 1986 and returned to recording in the 1990s, continuing to play live today (check their website, www.brewerandshipley.com, for details on their current activities). This reissue of their second and third albums is a consummate document of their rise to national prominence, and records that remain sources of pride to Brewer, who cites Weeds as "probably my favorite album that we did from the old days."